Marcos Rene Maidana showed tremendous heart, courage and a will to win on Saturday night stopping Victor Ortiz in 6 rounds. 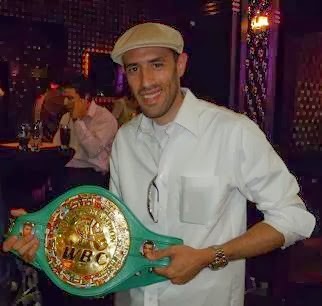 This junior welterweight from Argentina got up from knockdowns in the 1st round and twice in the 2nd round to emerge victorious in front of the crowd at the Staples Center in Los Angeles, California. He dropped Ortiz once in the 1st round and again in round 6. Maidana showed great bravery trading shots with Ortiz every round. The ringside doctor called for the fight to be stopped after observing Ortiz during round 6 after Maidana knocked him down. Round 1: Maidana attacks Ortiz. He is pressing forward and landed a left hook to Ortiz's head. Ortiz tries to get inside, but Maidana lands another left hook to the head. Maidana lands an overhand right. Ortiz lands a hard counter right hook that drops Maidana near the ropes. Maidana gets up and floors Ortiz with a straight right to the head. Maidana jumps on an unsteady Ortiz. Ortiz lands a short left uppercut and right hook to Maidana's head. Ortiz lands a flurry and Maidana counters with a right. Round 2: Maidana lands an overhand right. Maidana coming forward and Ortiz is trying to counter him. An overhand right followed by a left hook to the body lands for Maidana. Ortiz fires back. Ortiz lands a right uppercut-right hook combination. Maidana is making Ortiz fight at a furious pace. Ortiz drops Maidana with a hard right hook to the head. Ortiz jumps on him again landing a right uppercut. A straight left sends Maidana into the ropes. Another right hook to the head floors Maidana. Round 3: Both fighters jab to the body. Maidana lands an overhand right. Ortiz responds with a volume of punches. Maidana stuns Ortiz with a right to the head. Maidana attacks, but backs off when Ortiz lands a right hook. Ortiz hits Maidana with a straight left. Round 4: Maidana hits Ortiz with a right. Ortiz nails Maidana with a straight left. Maidana is throwing wild punches. Ortiz hits Maidana with a right hook to the head. Round 5: Ortiz lands a short right uppercut and then swarms Maidana with a volume of punches. He hits Maidana with a right uppercut. Maidana lands a solid right to Ortiz's head. Ortiz lands an overhand left. Chasing Ortiz, Maidana lands a short left uppercut. Ortiz lands a right hook to the body, but Maidana counters with a sharp left hook that cuts Ortiz above his right eye. Ortiz fights back and Maidana lands a right. Both fighters are throwing knockout like punches. Maidana lands consecutive hard right hands to Ortiz's head. The last one caused huge swelling under Ortiz's left eye. Round 6: Maidana attacks and lands an overhand right. Maidana drops Ortiz with a series of rights. The ringside doctor looks at Ortiz and stops the fight. Ortiz was battling hard, but when he got in trouble, he faded under pressure. Ortiz looked as if he did not want to fight entering the 6th round. After the fight, he told HBO's analyst Max Kellerman that he rather lose like this than on his back because he wants to speak well when he's older. Ortiz also said that he has a lot of thinking to do because he should not be taking a beating like this. Are you kidding me? Well, welcome to boxing Victor! Victor Ortiz is a disgrace and here is why. There are fighters out there, who are waiting for an opportunity that may never come, to fight on a major network such as HBO. Fighters are training right now in gyms, hoping that one day they can fight on television. Ortiz is an embarrassment to HBO, Golden Boy Promotions and himself. He does not have the true character that "real" fighters have deep down when the going gets tough. Especially in these economic times, there are many guys out there that could really use the opportunity to showcase their skills on HBO, Showtime, ESPN2, Versus.....that would NEVER quit. With all this being said, full credit goes out to Marcos Rene Maidana in his first fight in the United States. Hopefully, HBO will be showing Maidana again. Maidana is a guy that leaves it all out there knowing his opportunity may never come again. Maybe Golden Boy Promotions has been promoting the wrong guy? It is upsetting that some fighters are being promoted in this day and age like they are hall of famers way before they have proved anything. Hopefully, Ortiz will not be receiving air time from the networks again. That opportunity needs to be truly earned and awarded to someone like Marcos Rene Maidana. For fighters that show the effort and guts like Maidana, why does it take so long for a network to give them an opportunity? Marcos Rene Maidana improves his record to 26-1, 25 KO's. His lone defeat was a razor thin 12 round split decision loss to Andriy Kotelnik in Germany. Victor Ortiz's record drops to 24-2-1, 19 KO's. I re-watched a clip of the end and did see the Doc this time but i do think it was Ortiz's decision 2 not continue, and it really showed in his post interview also..